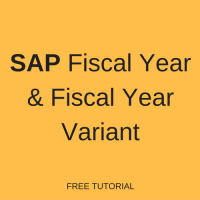 In this SAP FI tutorial, we will talk about SAP fiscal year and SAP fiscal year variants in SAP FI. You will learn what is the fiscal year in SAP FI and also study fiscal year variant periods, how to maintain period texts, shortened SAP fiscal years, shift of years in configuration of SAP fiscal year variants and other configuration topics. Accounting year is called a fiscal year in SAP. A fiscal year can have periods the same as the calendar year or not. As per the government regulations, fiscal year periods can be maintained. For example, as per India’s regulations the accounting year starts from April to March and as per the US regulations the accounting year starts from January to December. Fiscal year assigned to company code through a fiscal year variant. In the fiscal year variant posting periods, period texts will be maintained. One fiscal year variant can be assigned to many company codes. 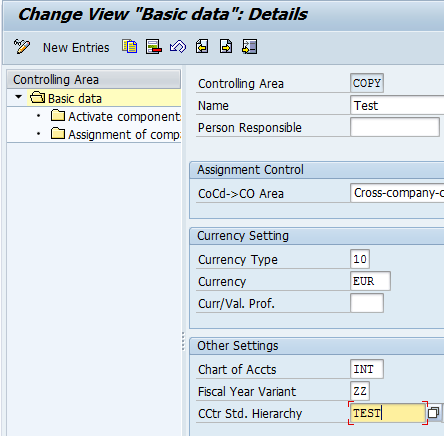 SAP standard provided fiscal year variants already in the system, New fiscal year variant can and should be created by copying the existing variant instead of creating new entries. For example, there are fiscal year variants V3 (April to March with 4 special periods) and K4 (Calendar year with 4 special periods). Fiscal year variant configuration details are enclosed below. For a fiscal year variant periods are to be maintained in synchronization with the calendar. 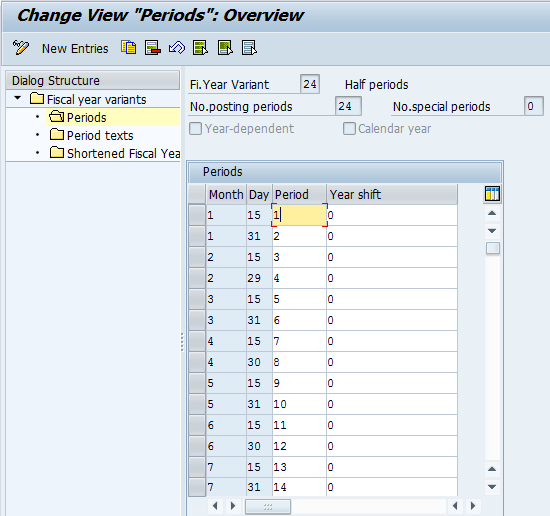 For example, the fiscal year variant V4 (April to March) with 4 special periods provided by SAP. The calendar year starts from January to December. In the above screenshot, Month and Day indicates the period and days as per calendar. Period and Year shift are maintained in SAP as per the accounting year. 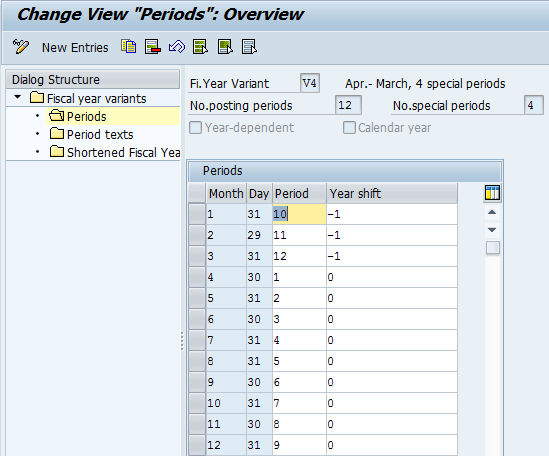 Note: In SAP, we can define periods up to 366. It is also possible that we can define 2 or more than 1 period for a month. SAP provided the fiscal year variant 24 as shown on the picture below. Month 1, Day 31, Period 10 and year shift 01. It means January period mapped in SAP as period 10. In case of the calendar year, SAP system won’t allow to maintain periods because it is same as calendar. Period texts can be maintained. Note: Year shift indicates if a fiscal year of the posting period is different to the calendar year. 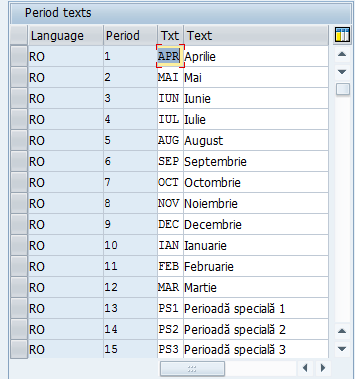 Period texts are necessary to maintain texts against a period with a respective language. If the number of periods in a fiscal year is less than number of periods in the calendar year then it is called a shortened fiscal year. Fiscal year variant must be defined as a year dependent. Fiscal year variant R1 is provided by SAP. While maintaining period’s fiscal year to be specified. Fiscal year variant ZZ is defined as a shortened fiscal year created with 9 periods as shown on the pictures below. Fiscal year variant periods are maintained for 2010 as shown below. After periods are maintained, a fiscal year variant is to be assign to a company code so that the SAP system will allow postings for this company code. Year shift filed is used for non-calendar year fiscal year variants. +1 indicates that a fiscal year is later than the calendar year. -1 indicates that a fiscal year is before the calendar year. 1) The financial year starts from April 2015 to March 2016 and we are in 2015. Months 1, 2 and 3 are in 2016 but the fiscal year is 2015, hence the year shift will be -1 so the number of periods for 2015 is 12. 2) The financial year starts from October 2014 to September 2015 and we are in 2015. Months 10, 11, 12 are in 2014 but the fiscal year is 2015, hence the year shift will be +1 so the number of periods for 2015 is 12. A fiscal year variant to be assign to controlling area in the transaction OKKP. A shortened fiscal year is to be assigned to depreciation areas in the transaction OAYP. Note: In asset accounting, the program ZRUMPF is to be executed to activate the shortened fiscal year as per the note 123026. (Table T093C-XRUMPF). Go to previous lesson: What is the Variant Principle in SAP FI? Thank you for the comment! Yes, you’re correct – it should be January and not October. I’ve updated the tutorial. Thanks a lot for the details in this session! What is the application of Shortened fiscal year? Even the configuration screen was a bit confusing to me. Appreciate if any simplified info can be provided. A shortened fiscal year is used in situations when a fiscal year should be shorter than 12 months. For example, if you implement SAP in a new company that has just been founded (e.g., in July), it will not be active for all 12 month of this year. So, you will need to use a shortened fiscal year. Got it. It’s clear to me now. I can relate it to the configuration screen now! I am new to SAP – And i will be commencing a job soon functioning as an accounts payable clerk. I will need to learn how to setup new vendors and entering invoices into the system and everything else pertaining to AP. Can you please help me or guide me how i can be helped. Thank you so much. Looking forward to a quick reply. You’re welcome to check the free tutorials available on this blog to learn about topics that you mentioned.